Astronaut Bruce McCandless II tests a Mobile Foot Restraint during a 1984 mission. 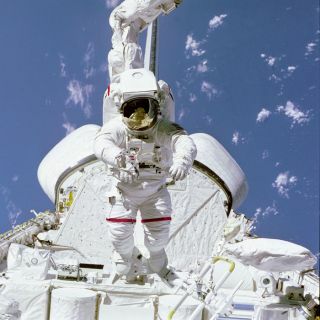 In this historical photo from the U.S. space agency, Astronaut Bruce McCandless II, STS-41B mission specialist, tests a Mobile Foot Restraint (MFR) attached to the Remote Manipulator System (RMS) aboard the Space Shuttle Challenger. McCandless appears to be walking on cargo, but is realy being flown over it by the combination MFR and RMS. His helmet visor reflects parts of the payload bay that can't be seen in the larger portion of the photo. Behind him can be seen both the Orbital Maneuvering System (OMS) pods.